Spirituality is a slippery word. 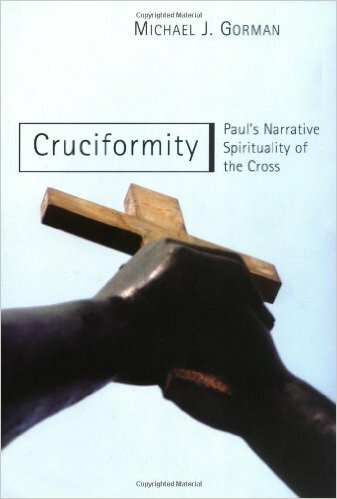 In the introduction to his 2001 book Cruciformity, Paul’s Narrative Spirituality of the Cross, Michael Gorman notes that for many, it is a term “associated with vague feelings of purposefulness or serenity and disassociated from religion, especially religious community” (p.2). He defines Christian spirituality as “the experience of God’s love and grace in daily life” and endeavors throughout the book to show that the defining characteristic of Paul’s spirituality was “cruciformity,” a term he uses to describe the concept of being conformed to Christ (p.3). Indeed, the basic aim of the book is really to unpack “what Paul means by conformity to the crucified Christ” (pp.4-5). So what makes the cross so central to Paul’s experience of God? A good place to begin is in 1 Corinthians, where Paul wrote, “I decided to know nothing among you except Jesus Christ, and him crucified” (2:2 NRSV). According to Gorman, “know” in this context means “something like ‘to experience and to announce in word and deed’” (p.1). Additionally, the “and” in this verse can be better translated to mean “even” or “that is,” resulting in the following translation: “I decided to know nothing among you except Jesus Christ—that is Jesus Christ crucified” (p.1). He delves into the striking nature of this claim, writing that, “For Paul, ‘to know nothing except Jesus Christ—that is, Jesus Christ crucified,’ is to narrate, in life and words, the story of God’s self-revelation in Christ’” (p.7). In this review, we’re going to look at the picture Gorman paints of Paul’s experience of God. First, we will look more at what made the cross central to Paul’s spirituality. This will lead us to one of Paul’s more foundational cross-centered passages, which Gorman calls “Paul’s master story,”—the Christ Hymn in Philippians 2:6-11—to find out in more detail what it means to say that conformity to Christ is a cruciform experience. We will then shift and trace Gorman’s line of argument through the remaining chapters of the book, examining how Paul’s experience of the cross manifested itself in faith, love, and hope. Lastly, we’ll conclude by stepping back for a brief reflection on some of the implications of Gorman’s thesis for Christian life today. [I]t is absolutely crucial for Paul—and for us—to keep the Father, Son, and Spirit united as one in relation to the cross. Otherwise, the cross becomes a place only for the outpouring of divine wrath on an innocent but passive “son”; the “spirit” of these two can hardly be one. Rather, for Paul the cross is the demonstration of God’s love and of the Son’s love, both of which become real by the action of their one Spirit (p.74). To demonstrate that the cross was central to Paul’s experience of the triune God, though, doesn’t explain why it was central; it doesn’t plumb the depths of the meaning of the cross for Paul’s spirituality. Therefore, let’s take a look at the Christ Hymn in Philippians and see how Gorman thinks this narrative sheds light on the matter. Let the same mind be in you that was in Christ Jesus, who, though he was in the form of God, did not regard equality with God as something to be exploited, but emptied himself, taking the form of a slave, being born in human likeness. And being found in human form, he humbled himself and became obedient to the point of death—even death on a cross. Therefore, God also highly exalted him and gave him the name that is above every name, so that at the name of Jesus every knee should bend, in heaven and on earth and under the earth, and every tongue confess that Jesus Christ is Lord, to the glory of God the Father (Philippians 2:5-11 NRSV). Gorman notes that the text’s “poetic form and vocabulary suggest to some a hymnic contrast between the first and second Adam, and to others the preexistent Wisdom of God that comes to earth” (p.90). More than anything else, though, he sees it as “an interpretation of the fourth (suffering) servant hymn found in Isaiah 52:13-53:12 in light of God’s exaltation of the crucified Messiah Jesus” (p.90). Throughout the text, one sees a basic pattern of self-emptying, of status-renouncing, of humiliation (vv.6-8), followed by exaltation (vv.9-11). For Paul, to be in Christ is to be a living exegesis of this narrative of Christ ,a new performance of the original drama of exaltation following humiliation, of humiliation as the voluntary renunciation of rights and selfish gain in order to serve and obey. Paul’s spirituality of cruciformity is a narrative spirituality, and the master narrative that shapes his spirituality is Philippians 2:6-11” (p.92). Thus, cruciform faith is not just a one-time decision. Nor does it shy away from a call to obedience, which is a term that often unfortunately brings to mind either blind, unquestioning faith or works-driven legalism (p.387). That’s not what Gorman is getting at. Cruciform faith entails living out a life story that is “unflinchingly oriented toward God in a way somehow similar to the way in which Christ was totally focused on God and God’s will” (p.387). This is not so different from Dietrich Bonhoeffer’s discussion of cheap grace vs. costly grace in The Cost of Discipleship. Bonheoffer wrote, “Cheap grace is grace without discipleship, grace without the cross, grace without Jesus Christ, living and incarnate… Such grace is costly because it calls us to follow, and it is grace because it calls us to follow Jesus Christ” (p.45). The last major dimension covered by Gorman is hope. Here we see more clearly that the resurrection is at the heart of Cruciformity. Without the resurrection, he affirms, the cross is just a symbol of folly (p.87). Hope is cruciform because it is based on the cross and resurrection of Christ, which defeated sin and death, obtained forgiveness of sins, and inaugurated God’s renewal of all creation (p.397). This is the kind of hope that gives encouragement to Christians facing affliction. Christ, too, suffered, but the last word is not death but exaltation and renewal. Cruciformity could strike some as being overly-focused on all of the things that we must do to re-narrate the story of the cross. However, Gorman argues that, “cruciformity is the initial and ongoing work of Christ himself—by his Spirit sent by God—who dwells within each believer and believing community, shaping them to carry on the story (Phil.4:13)” (p.400). It’s about ongoing transformation. Of course we will fail—repeatedly—as we aspire to live this out. When this happens, the cross is still the answer. It is still the means of forgiveness, reconciliation, and new life. It seems to me that, via Cruciformity, Gorman has helped recapture a vision for Christian spirituality that avoids becoming overly-individualized and nebulous, rooting it instead deep in the ground at the heart of the Christian faith—the cross. To a degree, his thesis is dependent upon seeing the cross as primarily being the self-revelation of the love of God in Christ. He does affirm the substitutionary and sacrificial aspects of Christ’s death, but wrath is not a primary theme here. Regardless, Cruciformity manages to engage creatively with controversial issues in Pauline scholarship without forgetting that Christian life needs to be lived, not just thought about. Even if you aren’t persuaded by Gorman at every turn, read it if you want a spiritually nurturing perspective on Paul. In my eyes, Cruciformity has earned itself a place on the bookshelves of anyone who cares about engaging both the mind and the heart theologically. This entry was posted in Book Reviews and tagged Cruciformity, Dietrich Bonhoeffer, Ernst Kasemann, Justification, Michael Gorman, Paul, Sanctification, Spirituality, theology by joecrow91. Bookmark the permalink. In my way of looking at it, without his mind-blowing spiritual experience, blinding light that knocked him off his high horse, so to speak, he never could have come up with this “cruciformity”; certainly no intellect however brilliant could have come up with it! Without the intense individual spiritual experience and encounter with the Living God of gods, no one can come to brilliant theology, the only one pure theology: the Theology of Jesus! Agreed. In Galatians 1:14 we find Paul saying, “For I want you to know, brothers and sisters,that the gospel that was proclaimed by me is not of human origin; for I did not receive it from a human source, nor was I taught it, but I received it through a revelation of Jesus Christ” (NRSV). I think Gorman would agree that the ultimate source of Paul’s theology (and life) was the work of God in Christ and the Holy Spirit, not some mere human construct, though his writings were faithful to and part of the original Apostolic witness of Christ. So, how do you think past theological traditions and personal spiritual insight relate to each other nowadays? When we have a saul-to-Paul-conversion spiritual experience ourselves, we suddenly can understand everything Paul says through the Holy Spirit and Light of Christ Jesus in us and the bible opens up to reveal the living Jesus as the Word, Light, Love and Spirit of God and we find his Word written on our hearts and mind so we can understand the things of the Spirit! God bless you! !